Operating System: None. Monitor in ROM. 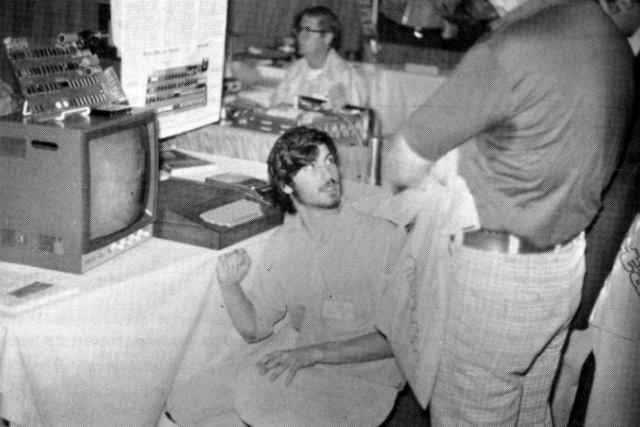 Only a handful of "Apple Computer 1" systems were built. This is serial number 50. They did not come with an enclosure, a keyboard, or a power supply, the user was expected to supply these. 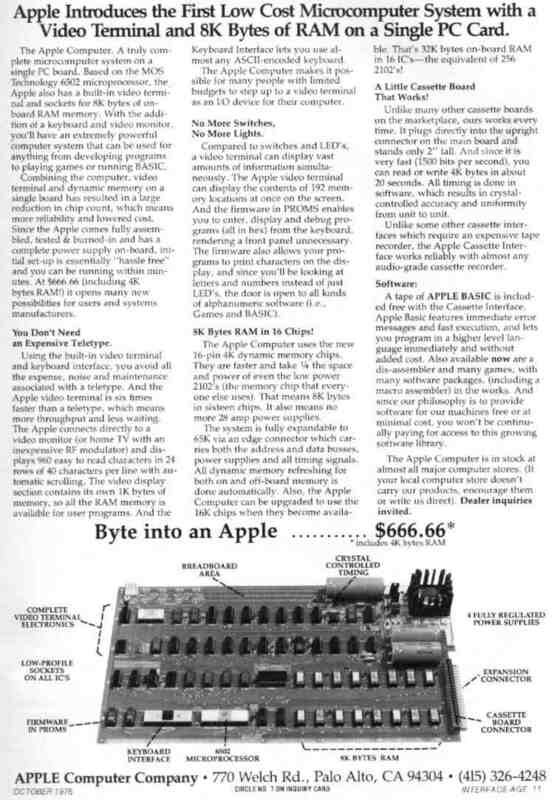 "The Apple Computer is a complete microprocessor system, consisting of a Mos Technology 6502 microprocessor and support hardware, integral video display electronics, dynamic memory and refresh hardware, and fully regulated power supplies. It contains resident system monitor software, enabling the user, via the keyboard and display, to write, examine, debug, and run programs efficiently; thus being an educational tool for the learning of microprocessor programming, and an aid in the development of software. The integral video display section and the keyboard interface renders unnecessary the need for an external teletype. The display section contains its own memory, leaving all of RAM for user programs, and the output format is 40 characters/ line, 24 lines/page, with auto scrolling. Almost any ASCII encoded keyboard will interface directly with the Apple system. The board has sockets for up to 8K bytes of the 16 pin, 4K type, RAM, and the system is fully expandable to 65K via the edge connector. The system uses dynamic memory (4K bytes supplied), although static memory may also be used. All refreshing of dynamic memory. including all "off- board" expansion memory, is done automatically. The entire system timing, including the microprocessor clock and all video signals. originates in a single crystal oscillator. 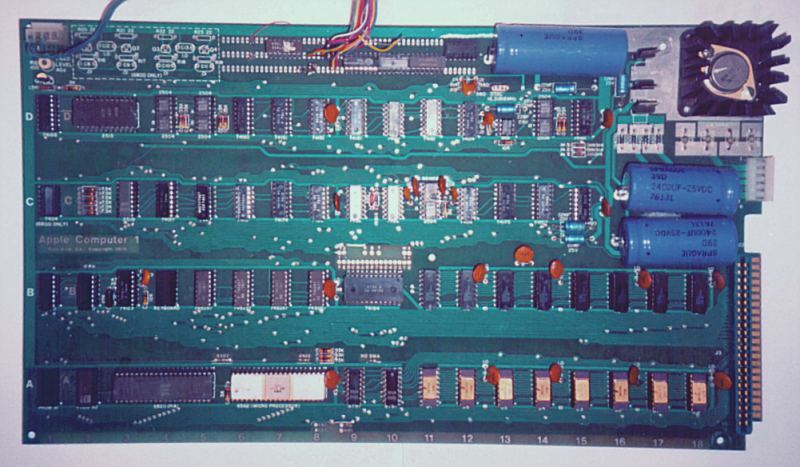 Further, the printed circuit board contains a breadboard area", in which the user can add additional "on-board " hardware (for example, extra PIA's, ACIA's, EROM's, and so on). " Here is the classic advertisement for the Apple 1. Click a thumbnail to see a larger version of the picture. Here's a more detailed shot of the Apple I. The center top area is the breadboard area. The wires and ICs mounted there were added by the original owner, and are probably a keyboard shift lock circuit. 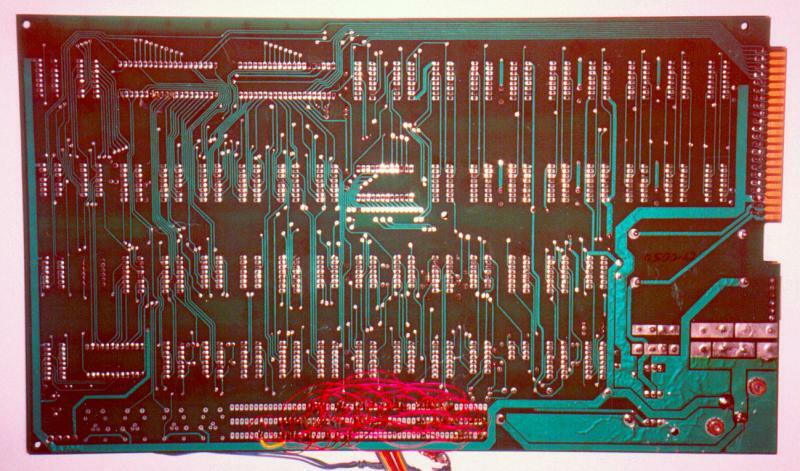 And a shot of the bottom of the circuit board. Note the user-added wiring on the back of the breadboard area (center bottom). Apple manual text and ads are copyright Apple Computer Corporation. Depicting obsolete products, not used for profit, withdrawn on request. Apple and related products are trademarks of Apple Computer Corporation.